Why are there so many dogs parks in metro Phoenix? Here is my theory. Any unleashed dog (with or without an owner) seen sniffing his way around a community park would be met with the disdainful look of the humans using the park. We all know that there are leash laws embedded in every city code. No matter how well trained or well mannered a canine might be, it is only appropriate that the dog’s owner respect the rights of others who use our parks and leash his or her pet. But what about a dog’s rights? Does it not have the inalienable right to sniff at every tree and bush? To run and bound through grass and mud? To meet others of his own kind? To develop those bonds that only a full speed chase can solidify? Well now, every dog can have her day. There are an abundance of places in the Phoenix area where dogs can meet and socialize. They are Dog Parks and they have proliferated around the valley. Dog parks are designated fenced areas where people can bring their Shitzhu and their Shepherd to allow them to romp unleashed with other dogs. Most of the dog parks have water available for the pets and cleanup facilities, like pooper-scoopers or plastic bags. Some have trees and benches and double-gated entrances. Common sense is the responsibility of the human involved when visiting an off leash facility. Here are some basics. Following these simple rules should make the Dog Park visit a pleasant one for everyone. Aggressive dogs are not welcome. Dogs in heat are not welcome. Your dog should be under voice control. Dogs should have current vaccinations. Don't bring more dogs than you can handle. Always clean up after your dog. Fill any holes your dog digs. Don't bring young children. These are not playgrounds for humans. Keep your pet on a leash until you are into the fenced area. Watch your dog while in the fenced area. 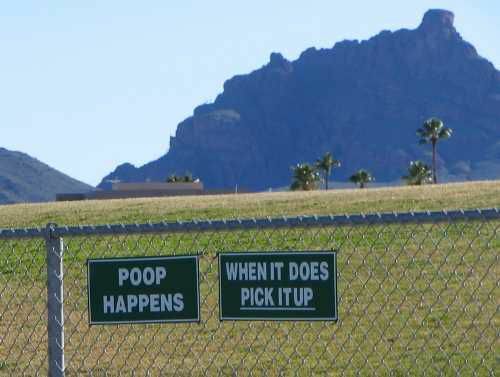 Abide by any local park rules. If you have information about a new dog park, or an update to the existing ones, please let me know. All dates, times, and offerings are subject to change without notice. You can see all the Phoenix area dog park locations marked on a Google map. In the left pane, click on the drop down arrow to see the list of dog parks. Click on the one that interests you to see it highlighted on the map. Alternatively, look for a dog park directly on the map that looks convenient and click on the icon to see the address. From there you can zoom in and out, and see what else is nearby. Did you see an error or an omission on the map? Contact me and let me know. The rules at the Avondale Dog Park are similar to other dog parks. Avondale specifies that no more than two dogs per owner are allowed in the area. On the south end of the park. One park for small dogs 29 lbs. or less and a large dog park for dogs 30 lbs or more. Water is available for the pets and there are cleanup facilities. Trees, benches and double-gated entrances are also present. Northern Horizon offers an opportunity for dogs to play off leash in a special dog park area. This dog park has an area made for small dogs fenced off from the larger dog park. The design of the dog park allows parks staff to keep one large section of the dog park open while allowing the other section to be worked on for maintenance. Water fountains and waste stations. This dog park is closed on Mondays for routine maintenance. Sahuaro Ranch Park has an off-leash dog area just north of the west parking lot and just south of the softball complex. There is a three dog per visit limit, and children under 13 must be accompanied by an adult. The Bark Park does not have separate lighting, and closes when the park closes at 10 p.m. There is a double gate, allowing easy access without letting the dogs that are there already out. It is basically flat and spacious. There are two separate fenced areas, one for large dogs and one for small dogs. This dog park can be found at 57th Avenue and Union Hills Drive in an area located northeast of the softball complex. Access is from the Foothills Library parking lot. The rules for the park are the sames as the rules for Sahuaro Ranch Park, above. This dog park was created and is maintained through a cooperative effort between PetSmart at the YWCA in Glendale. The City of Glendale is not involved with this park. There are two areas here, one for passive dogs and one for larger, more active dogs. It is located next to the Senior center on 61st Avenue, between Northern Avenue and Olive Avenue (east of Grand Avenue). You may not groom your animals in this dog park. Dogs must wear collars with identification and permit tags. Other standard dog park rules apply. The Goodyear Dog Park offers an area for passive dogs, one for active dogs, drinking fountains for people and dogs, benches, double-gated entrance, and a restroom. This dog park in Peoria has both small (25 lbs. or less) and larger dog sections. Dogs must be leashed prior to entering and upon leaving a fenced area; gates must be closed at all other times. Each dog handler must be at least 12 years old or accompanied by an adult. Limited is two dogs. All dogs must be licensed, vaccinated, and sporting a visible tag. Puppies must be older than 4 months. No smoking, no dog treats, no food or alcoholic beverages. This dog park in Peoria has both small (25 lbs. or less) and larger dog sections. Dogs must be leashed prior to entering and upon leaving a fenced area; gates must be closed at all other times. Each dog handler must be at least 12 years old or accompanied by an adult. Limited is two dogs. All dogs must be licensed, vaccinated and sporting a visible tag. Puppies must be older than 4 months. No smoking, no dog treats, no food or alcoholic beverages. The newest of the Peoria dog parks opened in September 2013. The dog park includes areas for dogs which are 35 pounds or less, and an area for dogs up to 100 pounds. There is a two dog per person limit, and children under 12 must be accompanied by an adult. Food of any kind, including dog treats, is prohibited. Opened in September 2012. It is a lighted dog park. It is one fenced park, so there is no separation for small dogs. There is a two dog per person limit, and children under 12 must be accompanied by an adult. No food of any kind, including dog treats, are permitted. This 1.5 acre dog park in Surprise has both small and large dog sections with shade structures. There are drinking fountains for pets and owners, picnic tables, a holding area. The dog park has landscaped trees and turf. The hours are sun up to 10 p.m. No dog treats or food permitted. No children under 13. Closed on Wednesdays for maintenance. There are three sections; one for dogs more than 20 lbs., one for dogs less than 20 lbs. and one will be used as an alternative when either of the sections are closed for maintenance. The dog park will be closed on Thursdays from 6 a.m. to 10 a.m. for mowing and cleaning. Opened in December 2015. Traveling pets have a place to stretch their legs, get a drink of water and even take a restroom break at Phoenix Sky Harbor International Airport. The dog park and pet rest area is located right outside of Sky Harbor's busiest terminal, Terminal 4, west end, baggage claim level. The "Bone Yard" provides a gravel area, shaped like a bone of course, where pet owners can take their companion animals for a restroom break. "Mutt Mitts" are provided for owners to clean up after their pets. The "Bone Yard" also provides two water faucets and buckets for pets that need to re-hydrate. The "Bone Yard" is shaded from the Arizona sun during day (hence no grass) and lighted at night. The "Paw Pad" is a fenced area for dogs to stretch their legs after a long flight. It offers water spigots and bowls, paw shaped decorations, “mutt mitts” for cleaning up and, of course, a red fire hydrant. Both pet parks at Sky Harbor are used also by the “working dogs” of the airport such as the TSA explosive detection canines. At the northeast corner of the park you'll find a gated area, divided into two sections, one for small dogs (under 20 lbs.) and one for larger dogs. There is a drinking fountain. 323 W. Culver St. (between 3rd and 5th avenues) near downtown Phoenix. This off-leash area has separately fenced ADA-accessible areas for large and small dogs. The large-dog area is .76 acre and the small-dog area is .23 acre. There are chilled water fountains with integrated drinking bowls at ground level for pooches. Children under 12 are not permitted in the dog park. Because the dog areas are separate, if your family has both a large and a small dog and you intend to use both areas you'll have to bring two humans. They are not close enough to provide adequate supervision from one spot. No grooming is allowed here, and no human food should be brought to the dog park. This dog park often has events or food trucks that stop by! It even has its own Facebook page. The 2.65-acre park has 6-foot-high perimeter fencing, two double-gated entrances, a water fountain, disabled-accessible sidewalks, two watering stations for dogs, benches, mutt mitt dispensers and garbage cans for dog waste. Large trees located along the perimeter of the park provide shade. There's a small area of the park that is fenced off for smaller dogs. Located at 21st Ave. north of Maryland, between Bethany Home and Glendale Roads in Central Phoenix. RJ Dog Park has two separate areas (one for larger dogs, one for smaller dogs) totaling more than 2 acres of space. Water and mutt mitt bags are available. The large dog area is lit at night, and there is a double-entry gate system. 48th Street and Pecos Parkway in Ahwatukee. Enter from 48th Street via Chandler Boulevard. This park features 2.5 acres and is divided into separate, double-gated areas for large and small dogs. There are water fountains, benches, trees, mutt mitt stations, and the park is accessible to people with disabilities. Located at 9833 N. 25th Ave. north of Dunlap. This park features 2.3 acres of grass surface divided evenly into separately fenced areas for large dogs and smaller dogs under 20 pounds. There are mutt mitt dog waste dispensers in each area. Dog water fountains have been installed. 17447 N. 20th St. & Located in Grovers Basin on 20th Street at Cave Creek Road and Grovers in North Phoenix. Located at 17642 N. 40th St. in the west end of the park north of the softball fields. The dog park features chilled drinking fountains for humans and dogs and double-gated, separately fenced areas for large and small dogs. Opened in August 2015. The dog park is two acres and features separate areas for large and small dogs, a shade ramada, drinking fountains and lighting. Located at 3345 E. Roeser Rd, near 32nd Street and Broadway. Call for information 602-495-5457. Opened in September 2015. The dog park covers about two acres and "features separate areas for large and small dogs. Amenities also include more than 30 shade trees, turf and decomposed granite surfaces, drinking fountains, LED lighting, concrete seating walls and painted fencing that blends in with the surrounding desert preserve land." Located at 26777 W. Deem Hills Parkway, near 51st Avenue and Deems Hill Parkway north of Happy Valley Road. Call for information 602-495-5458. The dog park at Copper Sky Regional Park is open from sunrise to 11 p.m. daily unless closed for a special event. Dogs are not permitted in any of the lakes or streams at the park. No smoking. If you have information about a new dog park, or an update to the existing ones, please let me know! There are two large (1+ acre) enclosures here which will alternate usage. There is no separate area for small or timid dogs. Built on top of an old Chandler landfill, north of Ocotillo Rd. west side of McQueen Rd. The dog park is open every day from 6 a.m. to 10:30 p.m. On Thursdays from 6 a.m. to 2:30 p.m. the park is closed to allow for maintenance. Children under 12 years old are not allowed in dog parks in Chandler. There are two separate enclosures here, one for smaller/shyer dogs and one for the rowdier crowd. There are double-gated entrances, water and pooper-scoopers. Three dogs maximum per person. The park is open from 6:30 a.m. to 10:30 p.m., except when reserved for police dog training. Children under 12 years old are not allowed in dog parks in Chandler. Maintenance closure on Wednesdays from 6 a.m. to 2:30 p.m. This dog park also includes an obstacle course. It is located at between Alma School Road and Dobson. The park is open from 6:30 a.m. to 10:30 p.m. Children under 12 years old are not allowed in dog parks in Chandler. Maintenance closure Tuesdays from 6 a.m. to 2:30 p.m. The Nozomi Park is located south of Chandler Blvd. just north of the Nozomi Aquatic Facility. The park is open from 6:30 a.m. to 10:30 p.m. Tuesdays through Sundays, and from 2:30 to 10:30 p.m. on Mondays. On Mondays from 6:00 am to 2:30 pm the park is closed to allow for maintenance. Children under 12 years old are not allowed in dog parks in Chandler. Located at Little League Park. Amenities include picnic tables, benches, water fountain and separate areas for large and small dogs.There is a limit of three dogs per visit. No smoking or food is permitted in the dog park. The bark park is open dawn to dusk every day, located at 6th Street and Church. This dog park is 2 acres with lighting at night, human and pet drinking fountains, tables, benches, and waste disposal stations. The dog park hours are 5:30 a.m. to 10 p.m., seven days per week. Cosmo Park is located at the northeast corner of Ray Road and the Santan Loop 202 in Gilbert. Hours are 6 a.m. to 10 p.m. Cosmo Park is named for Gilbert’s first police dog: Cosmo van Blitsaerd of Holland. The park features a lighted fenced dog park. Timid dogs are directed to use the northern part of the park. There is a lake where dogs may swim and two dog wash stations. Located north of McDowell Road off Greenfield. This 3-acre+ area is completely fenced with separate areas for timid and active dogs, park benches, and water fountains for both people and dogs. This facility is closed Thursdays for maintenance. Located on Southern between Lindsay and Val Vista. Countryside Dog Park is a 1.2-acre, fenced-in area with turf, benches, a doggie water fountain, and a separate area for timid dogs. Park patrons are encouraged to bring their used grocery bags to stock receptacles available for picking up dog waste. Park hours are from sunrise to 10 p.m. and the dog park is closed on Tuesdays for maintenance. There are lots of benches and a water hose area. There is a double-gated entry. No children under 12 are allowed without an adult, and only one dog per person is allowed in the enclosure. Mitchell Park also offers drinking fountains for both dogs and their people, tables, poop bags and trash receptacles, shade trees, and lights. 6 a.m. to 10 p.m. Closed Mondays for maintenance. This is the smallest of the bark parks we visited and we recommend small dogs only. Only one dog per owner is permitted. Creamery Park has drinking fountains for both dogs and their people, tables, benches, poop bags and trash receptacles, shade trees and lights. 6 a.m. to 10 p.m.
Papago Park offers drinking fountains for both dogs and their people, tables, benches, poop bags and trash receptacles, shade trees, and lights. Children under 12 must be accompanied by an adult. Dogs must be under voice control and the handler must be within the enclosure at all times. No more than 3 dogs per owner/handler. Dog handlers must repair damage from digging and must remove/dispose of hair from grooming. Food is not allowed within the dog run. 6 a.m. to 10 p.m. Closed Thursdays for maintenance. Jaycee Park offers drinking fountains for both dogs and their people, tables, benches, poop bags and trash receptacles, shade trees and lights. Children under 12 must be accompanied by an adult. Dogs must be under voice control and the handler must be within the enclosure at all times. No more than 3 dogs per owner/handler. Dog handlers must repair damage from digging and must remove/dispose of hair from grooming. Food is not allowed within the dog run. 6 a.m. to 10 p.m. The Tempe Sports Complex dog park offers drinking fountains for both dogs and their people, tables, benches, poop bags and trash receptacles, and lights. Children under 12 must be accompanied by an adult. Dogs must be under voice control and the handler must be within the enclosure at all times. No more than 3 dogs per owner/handler. Dog handlers must repair damage from digging and must remove/dispose of hair from grooming. Food is not allowed within the dog run. Open 6 a.m. to 10 p.m.
​Located south of Town Hall on Ellsworth Road. The off-leash park consists of two separate grass-play areas, with enclosed fencing, and a drinking fountain. Located at Paul Mason Sportsplex at Rodeo Park. No children under 12, no more than three dogs per person, no grooming in the park, no smoking, no food. Open daily from 7:30 a.m. to 9 p.m. The park opens at sunrise and closes at sunset. Standard dog park rules apply. This is a very large dog park, with a smaller, but still large area for passive/small dogs. There is a shaded area for humans in the dog park, plastic bags, water, seats and benches. This Scottsdale off leash area is 2/3 of an acre, with a shade structure and a people/dog drinking fountain. There are trees and some benches for the humans. No one under 16 years old is permitted without an adult. The park opens at sunrise and closes at sunset. Closed for maintenance on Thursdays from 9:30 a.m. to 12:30 p.m. The dog park is off Hayden Road on Pierce, behind the Salt Cellar Restaurant. It's large, flat and grassy. There is only one fenced area. The park is open from 5:30 a.m. to 10 p.m.
Only one word comes to mind when describing this dog park - HUGE! Benches for people, water fountains for dogs. The large run is for big/aggressive dogs, and there's a smaller one for small/passive dogs. 6 a.m. to 10 p.m. Closed for maintenance on Tuesdays and Fridays from 8 a.m. to noon. Closed for frost or wet conditions.